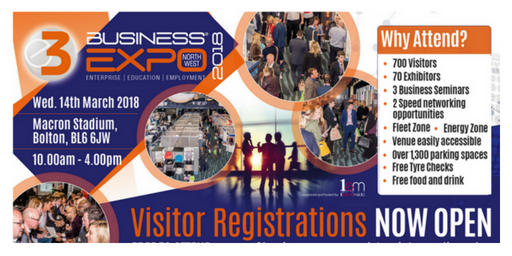 1 Events Media is pleased to announce that the North West E3 Business Expo 2018 will be held on Wednesday 14th March at the Macron Stadium in Bolton. The event will run between 10.00am and 4.00pm. Visitor registrations are now open. Aimed primarily at small and medium-sized enterprises, the E3 Business will host around 70 stands. Here, some of the North West’s most dynamic businesses will be demonstrating new technologies and cost-effective solutions to common commercial challenges. This year, the exhibition will feature a ‘fleet zone’ where delegates can get help with all things vehicular – everything from free safety checks to the latest developments in commercial vehicle security and tracking. Similarly, exhibitors in the Energy Zone will be on hand to address topics such as energy procurement, electrical safety, legal compliance and energy efficient building design. The Expo will also feature a series of seminars over the course of the day. Topics will include improving customer engagement, new approaches to business development and a Q&A panel session by UK Fleet Forum. The Expo routinely attracts visitors from a broad range of sectors. As ever, it will be attended by a diverse mix of businesses, social enterprises, entrepreneurs and representatives of professional bodies. 1 Events Media’s Director, Mubarak Chati, said: “The E3 Business Expo has rapidly become the North West’s most diverse gathering of business owners and managers. It is now an important feature on the regional business calendar, and 2018 will be bigger and better than ever. We’ve secured repeat booking from many of last year’s exhibitors and we have an impressive array of seminar presentations. Entrance to the Expo is free but anyone intending to visit is advised to register in advance rather than at the door, thereby avoiding queues. The registration form can be found here.